Over 3.500 people backed PACE on Kickstarter! Get your own PACE Link now and experience a new way of driving with PACE! This is finally a tool which has earned its name. It can show so many things – I had to use several apps at the same time bevore. PACE works like a Swiss Army knife for cars; with it, old cars are turned smart as well. Installing it is easy. You just download the PACE app onto your smartphone, sign up with your email address and plug in the dongle into the OBD2 port of your car. The feature Automatic Emergency Call is ingenious and should be standard in every car. The smartphone furthermore directely translates trouble codes into plain text and gives first estimates about whether you can drive on or whether you should visit a workshop right away. At one glance, users gain an overview of a wealth of important information about their cars and their style of driving. Instead of a long search for your parking spot, you can quickly locate and find your car with the PACE Find-my-Car Feature. Your smartphone will navigate you directly to your car. 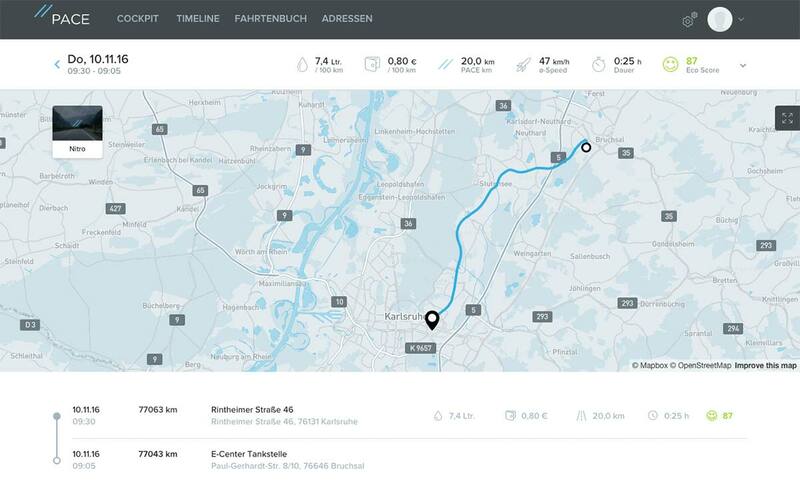 The German startup PACE has a smart solution for stress-free driving. PACE makes driving less stressful, cheaper and safer. * The features “Automatic Emergency Call” and “Find the Cheapest Gas Station” work only in Germany at the moment. In the future, these features will be available in other countries too. We keep you updated with news about this in our newsletter. Rpm, engine load, lateral acceleration and more – with PACE, you can always see if everything is working fine. The Performance Monitor shows you the data of your car while you are driving in real-time. You can configure the layout according to your own wishes! Is something wrong with your car? A trouble-code message can have a thousand different causes. Most often, the yellow engine control light turns on and the exact cause is unclear until after an analysis in a workshop. With PACE, you can easily read the trouble-code memory of your car by yourself. PACE tells you in simple and understandable ways what exactly the problem is, how you might solve it yourself and what exactly needs to be done at a workshop. You use your car for both business and private trips? PACE can help you to easily and comfortably keep a Logbook. In the PACE Car app, you can categorize your trips as private trips, business trips and commutes. You can also manage your trips via your web browser online in the PACE Cockpit. There, you can also export the Logbook as a PDF file. The Fuel-Saving Trainer gives you valuable tips about how to improve your driving style. PACE helps you with real-time feedback to lower your fuel consumption. With this, you can save money and protect the environment. Never pay too much for fuel again! PACE knows all current prices of fuel stations in your vicinity and their opening hours. With PACE, you can easily and quickly select the cheapest open fuel station around. Save money and time with the PACE "Find the Cheapest Gas Station" feature! This feature is so-far available in Germany only. You forgot where you parked your car? PACE can help you to find it! The Find-My-Car feature helps you to quickly find your car. After you stop your car, PACE saves its location. PACE shows you exactly where your car is and the fastest way to get there. PACE also tells you how long you have been parking. So you know when your parking ticket is close to expiring. With PACE, you always have an overview of how much you spend on fuel! Document your fueling processes with PACE! Like this, you always have a complete overview of how much money you spend on fuel. PACE shows you how much a single trip has cost you, you can archive receipts and evaluate everything concisely. Traffic jams or open road? Stay on top of things with PACE! The PACE Traffic Monitor shows you traffic jams and other obstructions in your vicinity and on your route. Thus, you can avoid delays and reach your destination faster and with less stress. PACE detects when you have an accident. If you are no longer able to get help, the PACE emergency center calls the emergency services. PACE also automatically transfers your location so that you can be helped faster. Just as with the eCall available in many new vehicles, you will always travel safely. The emergency call can be deactivated at any time. So-far, this feature is available in Germany only. Manage all your PACE data conveniently on your PC or your laptop! The PACE Cockpit offers you the possibility to log into your PACE account in your web browser. In the Cockpit, you can access an overview of all your cars, you can edit your trips and analyze as well as manage your Logbook. In three quick steps, your car turns into a smartcar! Plug the PACE Link into your car; the PACE app tells you how! Start the PACE app, connect with Bluetooth… Done! The PACE Link connects your car with your phone using Bluetooth LE. Just plug it into the diagnosis port – the “OBD2 port” – of your car. This port is a legal requirement for all cars in Europe built since 2001 (gasoline cars) and 2004 (Diesel cars). Moreover, manufacturers voluntarily equipped most cars built since 1996 with it. Is your car compatible with PACE? With our Compatibility Check, you can make sure whether your car is compatible with PACE and where you can find the OBD2 port at www.pace.car/cars. You can also find more information about this in the manual of your car. without any running costs for only 119 EUR! The PACE app (for both iOS and Android) can be downloaded at no cost from the app stores. Please note that the PACE app can only be used with the PACE Link! 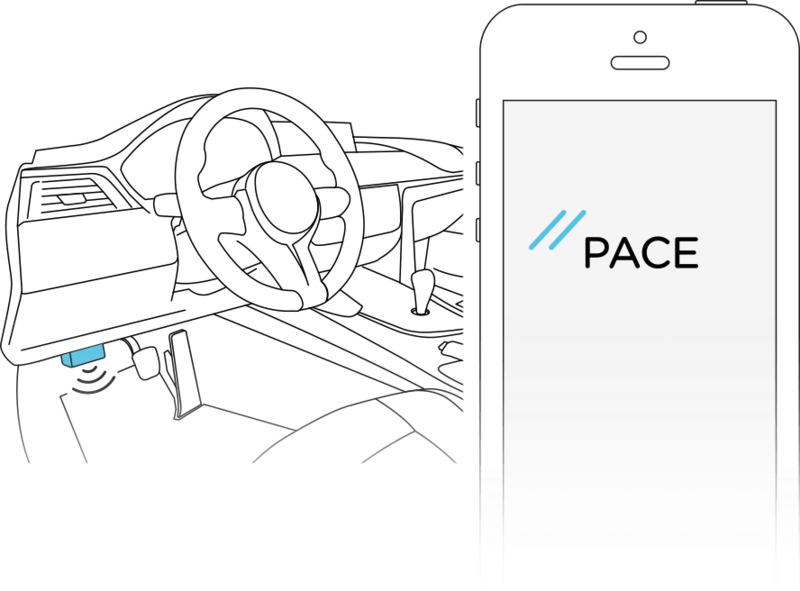 You can install the PACE app on as many devices as you want free of charge. PACE uses your mobile phone for localization via GPS and to connect to our PACE Servers. All connections are encrypted (Bluetooth LE 4.0/4.1 as well as AES-128 with CBC-MAC) to provide the highest level of security possible for your data. The PACE app also uses your phone to store the data of the PACE Link temporarily when you are using PACE offline. Become a part of PACE! Order PACE now Get your own PACE Link with free shipping and refundable for 30 days! PACE newsletter Subscribe to our newsletter here free of charge.